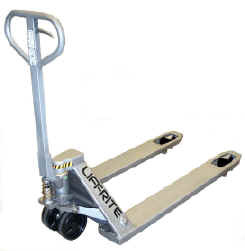 Lift-Rite's® All Stainless Steel Hand Pallet Truck (pallet jack) is necessary in environments that demand high standards of hygiene like food processing, pharmaceutical, and marine industries. This pallet truck is manufactured from stainless steel and other non-corroding materials, making it the ideal solution for corrosive environments. All surfaces are smoothed by glass blasting assuring easy cleaning for hygienic environments. The ten grease fittings further protect against corrosion. be confirmed at time of shipment. for more information on the specifications. all pricing will be confirmed at time of shipment.